Well, maybe not. 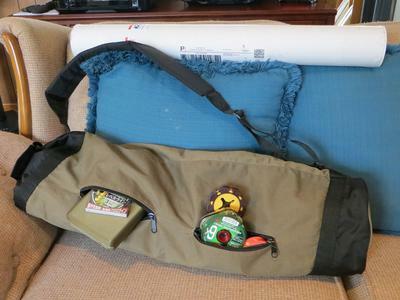 But my newest acquisition to carry my tenkara, keiryu, seiryu rods, and everything else I might need, including all the fly boxes in my arsenal, is a cheap ($18) bag for a yoga mat. There's even enough room in the bag to carry an on-stream bag, such as an ebira or larger pack and any and all other gear. Even room in the exterior pockets for a wide range of gear. I keep my rods in rod socks/sleeves so they are protected and not knocking together in the bag. But as I wrote this I wondered about how individual plastic cylinders (perhaps glued together?) might work for the rods (if they didn't cost more than the bag itself and add weight). I like the idea of carrying everything at once because I'm never sure what aquatic situation or species with which I may find myself involved. I could be fishing clear-water upland ponds, gravel pits, old coal strip pits (a couple quite deep ones have trout), riverine washouts or old river channels like my own Mariah Pond. There's also all manner of ditches (often gone wild) in the area, some with smaller fish like pumpkinseeds, bass, white bass or perch, some with larger bowfin shad or buffalo. Then there are the rivers which form the borders on all but one 'side' of my county. You can run into anything there from a 1 pound perch to 30+ pound carp (I think the record for the instroduced silver carp in Indiana is over 36 pounds) to 50 pound blue catfish. When I'm out and have a chance to fish, I like to be prepared for any situation. Yoga bags are most often on the order of 28 inches long, though there are some shorter for mats of a smaller width. I did one 'modification' to mine. I cut out a piece of cardboard to fit the bottom of the bag and glued shaped bubble-wrap to each side. I figure that may protect the bottom of the bag, hold it open to size, and also cushion the rods. I am not sure how long the bag may last. It may last only a season, or it may last longer as I only use it to 'bundle' my gear in one place. So this is only a suggestion. On the other hand, I guess such a bag could be used as a "poor-man's ebira." And that white mailing tube in the upper part of the picture? It was my first multi-rod holder. Chris sent it free with a keiryu rod. Thanks, Chris! Comments for Tenkara as Yoga? I used to sell yoga mat bags as tenkara rod bags, but I was never able to find a wholesale supplier for the small quantity I bought so I had to sell them at a higher price. It really is amazing how much stuff you can carry in one. As Lynn said, any number of rod rods and fly boxes, and your tamo as well. For plastic tubes - not for substantial protection but just to hold rods in the bag - consider the tubes golfers use in their golf bags. They're light and cheap. You'd have to cut them down, but they are thin plastic so they'd be easy to cut. Home Depot, Lowe's etc also have plastic tubes for fluorescent lights that are a bit more substantial if you want something a little stronger. Like Lynn, I just use the rod socks. I knew if anyone might have suggested their use it would have been you, Chris. So, I first searched your website to see if you had anything on yoga mat bags. I didn't find anything; so I guess that was far in the past. At least 'far' in terms of tenkara.